I'm a fairly lazy researcher and loathe the tedious process of referencing - like many in the new generation, I enjoy finding and using a new idea, care little of the source, file the articles poorly and then find it difficult to reference them properly. Luckily technology has come to the rescue. 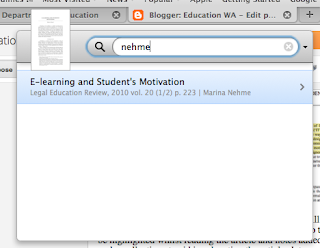 EndNote, Papers and Sente can do some of the menial tasks in the past I may have written applications to do for me. They do the work of filing and scraping references from online journals and all I have to do is verify the results to make sure it is correct and adequate. My first efforts were with Papers for iPad which made the process relatively easy, and now that I have Papers for my mac, creating bibliographies and citations is a trivial task - at about the level of complexity I am comfortable with. It's not to say EndNote and Sente are not better, it's just that I am familiar with this relatively cheap ($49 for a student version) option with iPad support. I know why referencing is important, I do - I just don't care that much, the implementation and spread of good ideas is what a research practitioner is about; and a good idea can come from anywhere not just a renowned journal or academic. Being able to recognise a good idea is a mark of a real practitioner, especially where early adoption is concerned. If you can't do this, you end up implementing ideas that are aging and reaching end of life cycle, taking high risks on projects that are likely to fail or using ideas that have little merit. Back to the problem at hand.. Papers installation and setup is quite simple. It took me a little longer than this to figure it out, I hope this can help save you a little time. Install papers from here. A 30 day trial was available at time of writing. 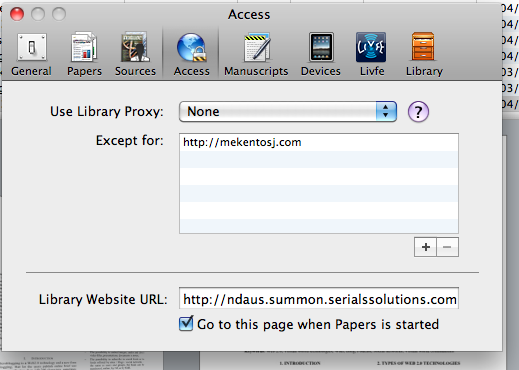 In the Papers application go Papers->Preferences->Access and enter the university library journal search url at the bottom of the page. Papers will attempt to scrape the page for the citation and is generally quite good. 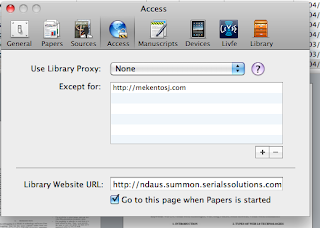 To increase accuracy of the citation download a citation file (the endNote/RIS citation format works well) and Papers will automatically detect the downloaded file and use it instead. Quickly you will find that although not perfect, it is superior to manually recording citations. 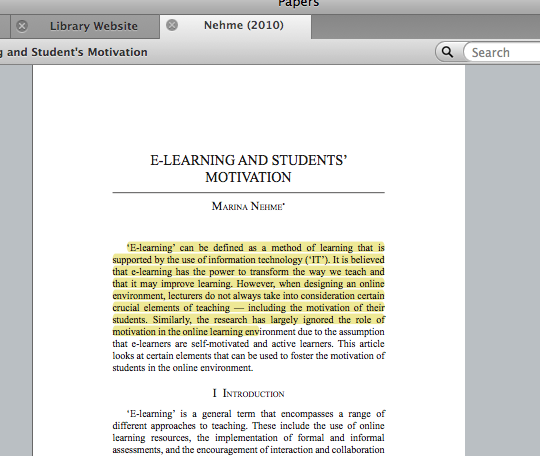 Next click on a fulltext pdf representation of the journal article. Papers will add it to the citation and the unfiled papers section for later reading. Each pdf/citation can be added to a collection for use when generating an article or research proposal. Once the article and citation is downloaded, the tab will be renamed with the name of the author (an important check to ensure the right citation is linked to the right article - sometimes it gets confused and overwrites the library website tab, restart the app if this happens). 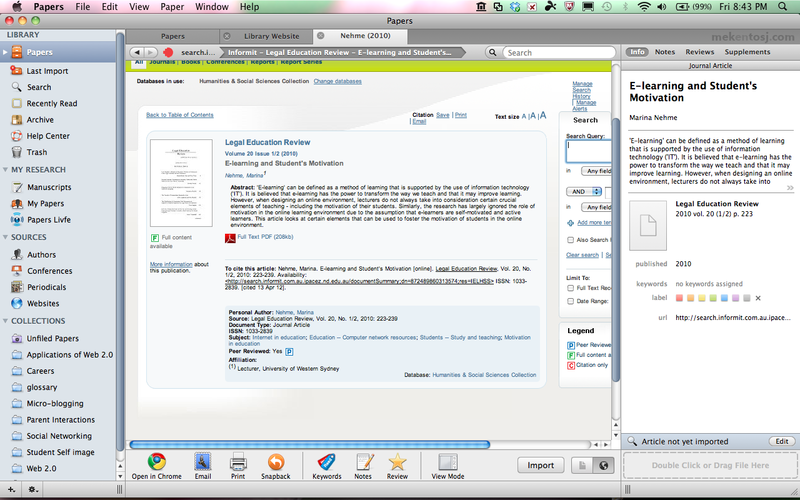 Sections of the article can be highlighted whilst reading the article and notes can be added for later use. 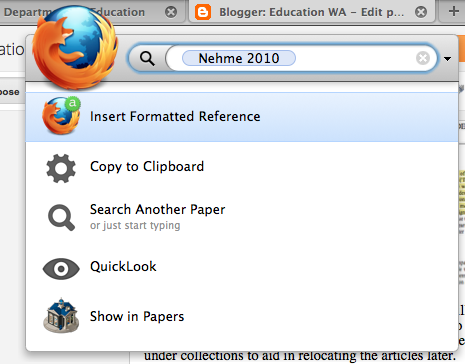 The journal articles get automatically renamed and can be filed in folders (collections) to aid in relocating the article file later. 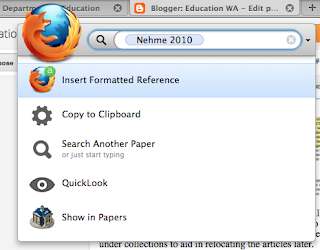 You can also add a bookmarklet to other browsers to add articles directly from a browser. This also works quite well but lacks the workflow listed above. Liking creature comforts, I enjoy reading articles on the couch on my iPad. Papers allows me to link to my iPad effortlessly and annotate articles. Grab it from the appStore. 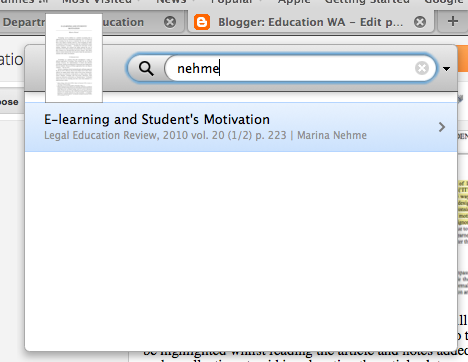 The true heart of Papers though is in the ease of adding citations to articles that you are writing. This works in Pages and Word, even Blogger! 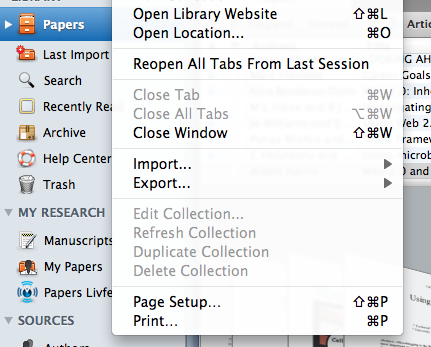 Within any of these apps press control twice and a citation menu appears. Type the author or title and then select the article that you are working with - it inserts the citation directly into the document. 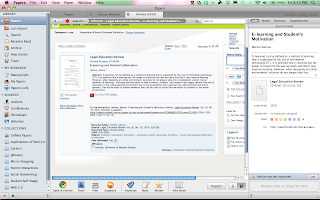 When you are finished adding citations, go back to the citation menu and at the touch of a button a reference list can be created. Nehme, M. (2010). 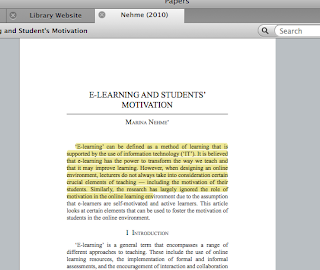 E-learning and Student's Motivation. Legal Education Review, 20(1/2), 223. Australasian Law Teachers Association.